These are the new Sharks jerseys 2012, the home and away shirts to be worn by South African rugby union outfit Natal Sharks in the 2012 Super Rugby competition. The new Sharks Super 15 2012 jerseys have been made by Reebok. The Sharks finished 6th in Super Rugby 2011 and were losing finalists in the 2011 Currie Cup, finishing second best to the MTN Golden Lions. The Sharks’ new Super Rugby 2012 jerseys have the same design as the 2011 kits ( inspired by the sunrays over the KZN coast), but there are minor differences, such as the placement of kit maker Reebok on the shirt. With the likes of the Du Plessis brothers ( Jan Nathaniel and Bismarck), Keegan Daniel, JP Pietersen and Patrick Lambie in their squad, the Sharks will be hoping for a good Super 15 2012 season. 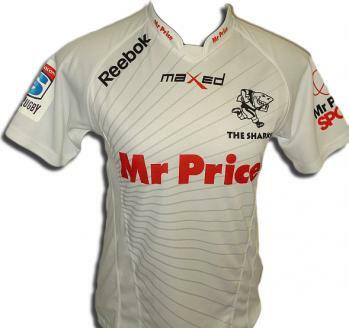 Mr.Price continue to be the principal sponsors of the Sharks 2012 jerseys. The home Sharks Super 15 top is black in colour, while the alternate/away shirt is white. Also check out our Super Rugby section for other Super 15 jersey releases for the 2012 season. This entry was posted in Super Rugby and tagged Reebok by New Rugby Kits. Bookmark the permalink. Not a Sharks fan myself, but this is definitely the pick of 2012’s rugby outfit designs. NOW THAT IS A PROPER SUPER 15 KIT!!! This is what i call a KIT. As a SHARK supporter we’ve got the Best clothing and a Big Variety to choose from. 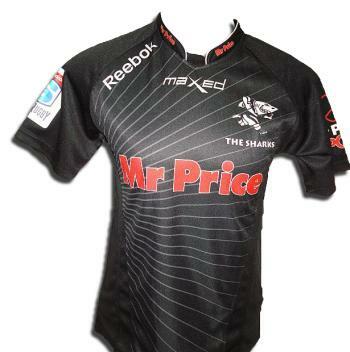 Well done to Reebok and Mr Price for the Designs and off course the Sharks Team for making us proud!!! Thanks for the compliments regards the jersey… we think it’s a cracker and will do our boys well! Reebok are proud of their contribution to the Sharks and eagerly wait for the season to unfold!!!! in addition to the great detail by the editor, we have included a few more panels to fit the player’s form, ensuring less targets to grasp for the tackler. Introduction of “Griptonite” in strategic areas will also assist in less knock-ons and keeping a tight ball in the bread basket. On the shoulders the grip will aid in binding and better traction in mauls. This all working together to create the best armour and equipment for our greatest Super Rugby franchise!!!!!! Go Sharks. I purchased a sharks away jersey from South Africa,I was impressed,with the post and packaging it was compatible with buying any rugby jersey in the uk. Why did they go away from this design ? It was so great ! !